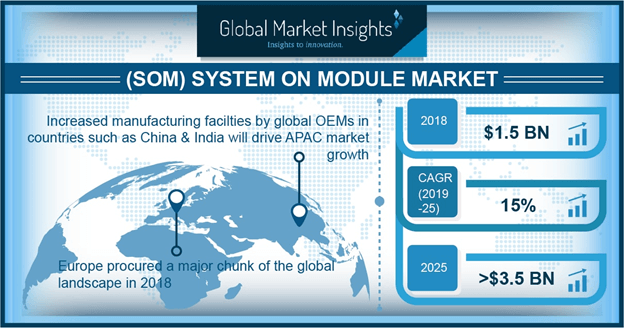 (SoM) System on Module Market size is set to exceed USD 3.5 billion by 2025; according to a new research report by Global Market Insights, Inc. The global system on module market is growing by the increased usage of IoT technologies & devices in smart & connected solutions across various industry verticals. The high utilization of these components in IoT offerings provides better performance & efficiency. It is a small-sized circuit, which integrates processor, memory, and interface on a single module. SoMs are preferred for the latest embedded systems due to compact sizes, optimized product development cost, advanced SoC & memory, reduced error risks, and computing capabilities. The market has a high growth potential owing to the increase in embedded computing devices in industries including defense, avionics, medical, and transportation. The ARM architecture has become popular due to its reduced complexity. Leading manufacturers in the system on module market including congatec, Aaeon, and Kontron provide ARM and x86-based SoMs for various applications. The ARM architecture is designed by ARM Holdings and the company provides a license to other manufacturers to build their own processors. Majorly adopted standards in the industry by manufacturers are COM Express, SMARC, Qseven, and ETX. Rabbit, EDM, and Apalis. COM Express is a popular standard in the global system on module (SoM) market and has offerings including COM Express 10, COM Express 7, and COM Express 2. This standard is compatible with high power pins and uses x86 architecture. SMARC has emerged as a popular standard and is positioned between COM Express and Qseven standards. It is compatible with low power consumption applications. Qseven is suitable for low power consumption and offers accessibility to fast serial interfaces. Increasing use of advanced embedded systems in medical devices is driving system on module market growth. The medical industry is facing growing challenges to offer real time health diagnosis for better well-being practices. AI has helped the medical industry to manage patients with real-time capabilities of embedded systems, yielding improved results with high accuracy. The demand for portable, miniaturized, and wireless technologies in medical applications, such as surgical implements and wearable medical fabric, will drive the market growth. Intel designed x86 architecture, which is widely used in current SoM products. Intel manufactures these processors and additionally licenses it to other manufacturers. AMD and Intel are the major x86 processor manufacturers. The x86 processors are based on Complex Instruction Set Architecture (CISA), requiring multiple cycles for their operations. SECO, Adlink, Axiomtek, and many other SoM manufacturers provide x86-based modules. The ARM architecture is emerging as a preferred architecture in the (SoM) system on module market owing to the reduced complexity and instructions required for their operations. Xilinx and NXP are some of the major ARM processor manufacturers. The system on module market has grown in other application areas such as building automation, defense, energy, and security. Embedded systems provide capabilities for surveillance and for the automation of the complex computing for precise results & information. Retail and gaming are some other application areas, where the market is expected to have a high growth potential. MSC Technologies, Aaeon, VIA, and congatec are the major manufacturers in the industry. These companies are focusing on technological advancements in their SoM products to gain a competitive advantage over other players and are frequently launching new application-specific products such as SoM for IoT enabled products.